Pentecost is the setting of the most spectacular scene in the historical books of the New Testament. A sound came from heaven like the rush of a mighty wind. Tongues of fire appeared and rested on the disciples — but did not burn them! The men rushed into the streets and began to proclaim Jesus Christ before the multitude that had gathered in Jerusalem for the feast day. The Holy Spirit arrived in a great show of power, attended by wonders and miracles, manifest before a cast of thousands. Pentecost was a singular event — unprecedented, although long foreshadowed; unique, although it would extend throughout subsequent history through the ministry of the Church. Jerusalem’s streets were crowded with pilgrims from all over the known world. Pentecost was the annual harvest festival of the Jews, and it was one of three feasts that all Jewish males were bound by law to observe in the holy city. The Lord God had said to Moses at Sinai: “Three times in the year you shall keep a feast to me. . . . Three times in the year shall all your males appear before the Lord” (Exod. 23:14–17). The three days of obligation were Passover, Sukkot (known in English as the Feast of Booths or Tabernacles), and Pentecost. The name Pentecost came from the Greek word for “fifti­eth” (pentekostos). In Jesus’ time, the feast took place, for most Jews, on the fiftieth day after Passover. In Hebrew the day was Shavuot, the Feast of Weeks, because it took place on the day following a “week of weeks” — seven times seven days — counting from Passover (Lev. 23:15–16). It was originally an agrarian festival, celebrating the beginning of the harvest season. God commanded through Moses: “You shall keep the feast of harvest, of the first fruits of your labor, of what you sow in the field” (Exod. 23:16). The feast was a ritual reminder that God was the source of Israel’s blessings, and they owed their first and best of everything to him. Over the centuries, Pentecost had grown in importance and had gathered layers of spiritual and historical significance. By the lifetime of Jesus and the Apostles, it had become primarily a celebration of the giving of the law to Moses. As Passover recalled the Exodus from Egypt, so fifty days later the feast marked the great event at Mount Sinai. Pentecost, then, was a celebration of the covenant, God’s family bond with Israel. The Book of Jubilees, composed in the first centuries before Christ, claimed that Pentecost was the actual anniversary date not only of Moses’ covenant at Sinai but also of God’s covenants with Noah and with Abraham. For Jews of the first century it was a great feast, a holy day of obligation. And those who lived in distant lands fulfilled their duty by traveling to Jerusalem. The city’s population swelled, and there was a general feeling of festivity, of gratitude for all good gifts, from the Exodus and the Law to the abundance of the barley harvest. The Apostles, meanwhile, were living in quiet expectation. They knew that something big was coming. Jesus had prom­ised them as much when he took his leave from them. They knew of the Holy Spirit from Jesus’ promises at the Last Supper (John 14:16, 26). The Holy Spirit would be a “counselor” and a “consoler,” sent by the Father, to “teach . . . all things” and remind the Apostles of everything Jesus had said. The Holy Spirit would be with them forever. It was a mysterious promise. When Jesus spoke of the Spirit, he seemed to be talking about a person — not simply a force or a grace — and that person seemed to be divine. For forty days after Passover — forty days after his Resurrection — Jesus appeared to the Apostles and taught them. Yet he trained their gaze forward in time, as if his work was not yet done, as if his Passover awaited its completion. After Jesus’ Ascension, the Apostles returned to their room and, once again, locked themselves in. They attended to some practical matters; they selected a replacement for Judas. Most of all they prayed. St. Luke, the author of Acts, after listing the names of the Apostles, says: “All these with one accord devoted themselves to prayer, together with the women and Mary the mother of Jesus, and with his brethren” (Acts 1:14). It is significant that the whole Church is with Mary as it waits to be “born” on Pentecost. Other than the Apostles, she is the only individual to be named. In Luke’s other New Testament book, his Gospel, he repeatedly suggests that Mary served as a source of his historical information (see Luke 1:2; 2:19, 51). Her placement in this scene may serve a similar purpose. It also establishes a neat parallel between Acts and Luke’s Gospel, which opens as young Mary awaits the overshadowing of the Holy Spirit (see Luke 1:35). Luke, as a student of St. Paul, knew the Church to be the “body of Christ” (see 1 Cor. 12:27; Eph. 4:12). Just as Jesus’ physical body was conceived by the power of the Holy Spirit and through the willing prayers of Mary, so his Mystical Body would be conceived in a similar way. Thus, Luke gives due notice to Mary’s presence in the Upper Room in Jerusalem. When the day of Pentecost had come, they were all together in one place. And suddenly a sound came from heaven like the rush of a mighty wind, and it filled all the house where they were sitting. There appeared to them tongues as of fire, distributed and resting on each one of them. And they were all filled with the Holy Spirit and began to speak in other tongues, as the Spirit gave them utterance. Perhaps the Apostles were expecting something to happen on the feast. They knew that Jesus, in his earthly ministry, had scrupulously observed the religious calendar and made his annual pilgrimages to Jerusalem, just as the law required. No matter what they expected, however, Pentecost surely exceeded it. The cosmic phenomena, the wind and fire, would have been familiar because of the context of the feast day. They had been prefigured when God gave the law to Moses. In those days, “there were thunders and lightnings, and a thick cloud upon the mountain, and a very loud trumpet blast. . . . And Mount Sinai was wrapped in smoke” (Exod. 19:16, 18). Now, on the anniversary, came fire from heaven and a sound like the rush of a mighty wind. This article is from a chapter in The Apostles and Their Times. Click image to learn more. The list is orderly, running from east (Parthia) to West (Rome). The people present were ethnically Jews, but linguistically and culturally diverse. At that Pentecost, God made them all one people, even with their differences. The gift of the Holy Spirit was not that each heard the gospel in Hebrew, Aramaic, or Greek and understood it nonetheless, but that each heard “in his own native language.” They were empowered, then, to take the gospel back to their places of origin. In Luke’s description of Pentecost, even the listings are rhetorically forceful — even the allusions to the Old Testament are resonant. Chapter 2 stands in stark contrast to chapter 1, where both the lists and the citations of the law seem muted. Now there was action. Now there were arguments. The crowd grew as gawkers and scoffers joined the genuinely cu­rious and the piously astonished. Some asked, “What does this mean?” Others said the meaning was simple: these men are drunk. Peter described the “last days” in terms that were fulfilled that very day. The Spirit was indeed poured out, and the effects were visible in the streets of Jerusalem, noticed even by those who did not believe. This was the day the Lord had promised. From the moment of Pentecost forward, gifts once reserved to a few— such as prophecy —would now be distributed widely, from Parthia to Rome and beyond. Peter drew from the heritage he held in common with his hearers. He quoted the prophet Joel and the psalms of David. He pointed to nearby monuments that would have been familiar to the pilgrims. Peter established his standing as a Jew among Jews; and then he called them, as Jews, to join him in repentance for any part they may have played in the Crucifixion of Jesus. This is not an anti-Jewish tirade, as some have portrayed it. Peter is speaking as the guiltiest man pres­ent, and he could not have conceived himself as anything but a Jew. The urgency of his call was evident not only from his tone, but from the circumstances — the signs and wonders that re­called the giving of the law. It should come as no surprise, then, that many found his case compelling. “What shall we do?” they asked (Acts 2:37). And Peter said to them: “Repent, and be baptized every one of you in the name of Jesus Christ for the forgiveness of your sins; and you shall receive the gift of the Holy Spirit” (Acts 2:38, emphasis added). This is the message that would always be associated with Peter. Salvation is, by definition, the gift of the Holy Spirit (1 Pet. 1:2); and Baptism “now saves you” (1 Pet. 3:21). Peter extended the invitation not only to his hearers but to their households as well — “your children” — and to their loved ones still in their native lands. It was a remarkable offer. At least three thousand people, St. Luke tells us, took up the invitation and were baptized on that first Christian Pentecost. It was not yet evident that this salvation would be ex­tended to non-Jews. But the means were now in place for the message to extend to the farthest reaches of the earth. It would be universal in scope. It would be catholic in its reach. From its birth the Church was one. It was holy with the holi­ness of God, suffused by the Spirit. It was patently catholic, and it was undeniably apostolic. Sometimes the Christian Pentecost is portrayed as a wild, anarchic event, producing a kind of cheerful chaos — a riot of movement with no discernible order. That was indeed the conclusion of the cynical onlookers — those who stood at a safe distance that day in Jerusalem, and who concluded that the Apostles were drunk on new wine. But it does not represent the perspective of faith. On Pentecost, the Church was born with an unprecedented degree of freedom. As God had once given the law to Moses, so now he gave his own Spirit to the Church. The Spirit was manifest in unexpected prodigies and charisms (from the Greek word for “gifts”) — such as speaking in diverse tongues and understanding those tongues. Mere men were entrusted with the means of salvation, a divine action. Yet among those charisms was the gift of leadership, authority. It is significant that not everyone preached on the first Pentecost; not everyone led; not everyone taught; not everyone issued the call to repentance. Peter did; the Apostles did. They fulfilled the roles of the office they had been given by Jesus. The Church, from the beginning, had a hierarchy, a sacred order, although that order would develop further over time. The order of deacons, for example, would appear later in the book of Acts (6:3–6), as would the office of elder, or presbyter (20:17, 18). Over the next century, the roles of each office would become clearer as the Church grew. By the beginning of the second century, St. Ignatius of Antioch could write to far-flung churches and assume that each had a three-tiered hierarchy of bishop, presbyter, and deacon; and each gathered regularly, as the Apostolic Church did, for the Eucharist (Acts 2:42). The Apostles had already been commissioned to do what Jesus had done, and do it all in the name of God. Now they were empowered to do so. Every person baptized that day received, to some degree, a share in the Apostles’ mission — for they received a share in the life of Jesus Christ. In Baptism they became “partakers of the divine nature” (2 Pet. 1:4). One of the great preachers of the early Church, St. John Chrysostom, identified this as the difference made at Pentecost: a tongue of heavenly fire had been added to human nature. Salvation now was nothing less than the sharing of divine life with all those who believed in Jesus Christ and were baptized — all three thousand on that first day. Some years before Jesus had said to his disciples, “The harvest is plentiful” (Luke 10:2). The great harvest began, appropriately enough, at Pentecost, the feast of the harvest — the day dedicated to the gathering and offering of firstfruits. At every level, the ancient feast found fulfillment that day in Jerusalem. The harvest was in. The new Passover reached its completion. The new exodus brought a renewed Israel to receive the new law — the Spirit of God — and now the New Covenant would extend to the very ends of the earth. This would be the task not of scholars or financiers, not of armies or kings, but of rough men with limited abilities. Even in this detail, the story follows the pattern of God’s choices. Moses himself was halting of speech. David was the unimposing and least likely among a large brood of brothers to be made a king. The Apostles received the divine power of the Holy Spirit to accomplish the work Christ had assigned them. They succeeded. The first book of the Bible told the story of how the people of the earth became peoples opposed to one another. It is the story of the Tower of Babel (Gen. 11:1–9). All subsequent history followed the same narrative of endless division. Pentecost, however, reversed the process, repaired the breaches, restored broken bonds, and gathered the firstfruits — the tribes of Israel from their dispersion. Soon salvation would go out to the nations, the Gentiles, as well. The gift of Pentecost would be extended to every believer through the ministry of the Church. The Apostles Peter and John traveled from Judea to Samaria, where a number of believers were eager for the gift. “Then they laid their hands on them and they received the Holy Spirit” (Acts 8:14–17). 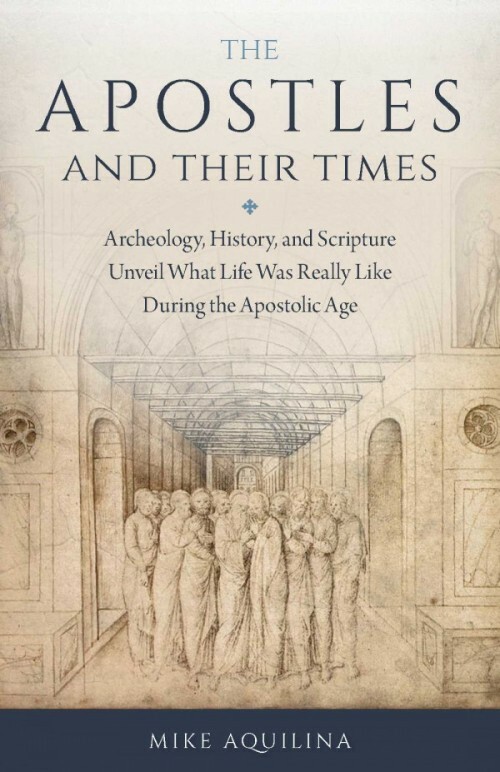 Editor’s note: This article is adapted from a chapter in The Apostles and Their Times — Archaeology, History, and Scripture Unveil What Life Was Really Like During the Apostolic Age. It is available from Sophia Institute Press.